Use the recommended grade of oil. 1. When you check the inflation pressure, make sure the tires are cool — meaning they are not hot from driving even a mile. (If you have to drive a distance to get inflation, check and record the tire pressure first and add the appropriate inflation pressure when you get to the pump. It is normal for tires to heat up and the inflation pressure inside to increase as you drive. Never “bleed” or reduce inflation pressure when tires are hot.) 2. Remove the cap from the valve on one tire. 3. Firmly press a tire gauge onto the valve. 4. Add inflation to achieve recommended inflation pressure. 5. If you overfill the tire, release inflation by pushing on the metal stem in the center of the valve with a fingernail or the tip of a pen. Then recheck the inflation pressure with your tire gauge. 6. Replace the valve cap. 7. Repeat with each tire, including the spare. (NOTE: Some spare tires require higher inflation pressure). 8. Visually inspect the tires to make sure there are no nails or other objects embedded that could poke a hole in the tire and cause an inflation pressure leak. 9. Check the sidewalls to make sure there are no gouges, cuts, bulges or other irregularities. Experts say the best advice for driving in harsh winter weather is to not drive at all, but according to the U.S. Department of Transportation, driving – even in ice or snow – is an everyday part of life for the owners of more than 250 million vehicles on the road in the U.S. • Double the anticipated stopping distance when braking anytime conditions are not dry. It will take longer to come to a stop in snowy or icy conditions. • Do not assume a four-wheel drive vehicle will stop faster than a two-wheel drive vehicle – four-wheel drive offers no braking advantage. • Always reduce speed during winter conditions. • When purchasing winter tires, replace all four tires. Due to the different grip capabilities of summer, all season and winter tires, the driver will not get all of the handling and traction benefits if all tires are not replaced. • Drivers should keep in mind that it is best to check their owner’s manual to see how their vehicle should be serviced in cold weather. The only part of a vehicle to touch the road is the tires, and tire tread is a vital part of handling, cornering, accelerating and braking. • For winter weather driving, a general rule is the more tread depth, the better. A tire's minimum tread depth should be more than 2/32 of an inch deep all around the tire. Drivers can check tread depth by using a U.S. penny. Insert the edge of the coin into the tread with Lincoln going in headfirst. If the top of Lincoln's head is covered by tread that means there is at least a minimum acceptable amount of tread; if the top of his head is visible at any location on the tire, the tire is worn out and it's time to replace it. For winter driving in adverse conditions, your tires should exceed the minimum tread depth standard. • While examining the tread, also look for signs of uneven wear or damage such as cuts, cracks, splits, punctures and bulges. These conditions shorten the life of tires and, if not corrected, further tire damage, tire failure or air loss may occur. Tire pressure plays a critical role in the overall performance of tires. Underinflation creates excessive stress on the tire, while over inflation can cause uneven wear in addition to handling and braking issues. • Tire pressure decreases by about one pound per square inch for every 10-degree drop in outside air temperature, so it is vital that drivers check the air pressure regularly as winter weather approaches. • Drivers should follow the guidelines found in the vehicle owner’s manual or tire placard (or sticker) attached to the vehicle door edge to determine the correct air pressure for their vehicle's tires. A common myth is that the tire pressure listed on the sidewall is the optimal pressure, while in reality it is the maximum pressure. • Air pressure should be checked when the tires are cool, meaning they are not hot from driving even a mile. 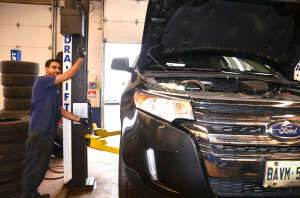 • Should any of these checks reveal the need for required maintenance – or when in doubt about the condition of their tires – drivers should take vehicles to a tire dealer for a professional inspection. Paying attention to road conditions and weather can help ensure safe travels. Snow and wet weather require extra attention and quick response while driving. Driving too fast on wet roads, through standing water or in the rain, can cause your tires to hydroplane. This means that your tires travel on a film of water rather than contacting the road. After a dry spell, rain can further reduce traction from oil and other substances that have collected on the roadway. In addition, leaves can hide moisture on a road surface, even long after the rain has stopped. When roads are wet, slow down and drive carefully. Obviously, it's best not to hit potholes or objects in the road, so avoid them and other hazards in the road. But if you can't avoid them, remember that the faster you are going when you hit something, the greater the impact on your tires so slow down as much as you can without endangering yourself or others. If you can’t avoid a pothole, don’t apply the brakes when you hit it. Instead, apply them as you approach the hole, and release them just before striking it. This slows you down, but allows the tire to roll as it hits, softening the impact. If you hit an object or hole, have your tires checked by a professional. Such collisions can cause internal tire damage that you can’t see—but which can cause problems later on. Sometimes, a tire can be severely damaged and travel hundreds or even thousands of miles before failing. A vibration or rough ride may be a sign of such damage—and that it is time for a replacement. Remember that tires lose pressure when the air temperature gets colder (about 1 psi or 7 kPa for every 10°F drop in temperature). Tires may also lose a certain amount of pressure due to their permeability (about 2 psi or 14 kPa per month). Never reduce tire pressures in an attempt to increase traction on snow or ice. It does not work and your tires will be more susceptible to damage from underinflation. In snowy areas, some locations may have “snow emergency” regulations which are invoked during heavy snowfalls. Check with authorities for the rules in your area. Under some rules, motorists are subject to fines if they block traffic and do not have snow tires on their vehicles. Slow down and drive carefully in all winter conditions. Mountain-Snowflake Symbol - Tires designed for use in severe snow conditions generally have tread patterns, structure and materials to give superior performance. These tires are marked with the mountain/snowflake symbol along with the “M+S” designation. Chains - Make sure chains are the proper size and type for your tires, otherwise they may damage the tire sidewall and cause tire failure. If you have dual tires on your vehicle, particular care must be taken to assure adequate clearance between loaded tires to avoid damage from chains. Consult a tire service professional for proper application. For more information concerning winter tires visit the winters tires section. If you have any questions, please contact your local tire dealer or call Cooper Tire at 1-800-854-6288. A dirty air filter prevents the engine from breathing properly, which can decrease fuel mileage and performance and make the engine work harder than it needs to. Let your vehicle breathe! Change the air filter once a year or when recommended in your owner’s manual. Change it more often if you drive in dirty or dusty conditions. If your vehicle is equipped with a cabin air filter, change that too. A dirty cabin air filter reduces the airflow through the vehicle’s ventilation system. Cabin air filters help keep pollens, fumes, smoke, and other materials from reaching the inside of a vehicle. See the owner’s manual to determine if your vehicle is equipped with a cabin air filter.